Background: Until recently, one of the main reasons for mortality has been infectious diseases, and bacteria that are drug-resistant have emerged as a result of the wide application, as well as the misuse of antibacterial medications. Having multidrug-resistance, bacteria present a great problem for the efficient management of bacterial infections and this challenge has resulted in the creation of other means of dealing with bacterial diseases. Of late, metallic nanoparticles (NPs), employed as antibacterial agents, have the potential for use against resistance to bacterial drugs. 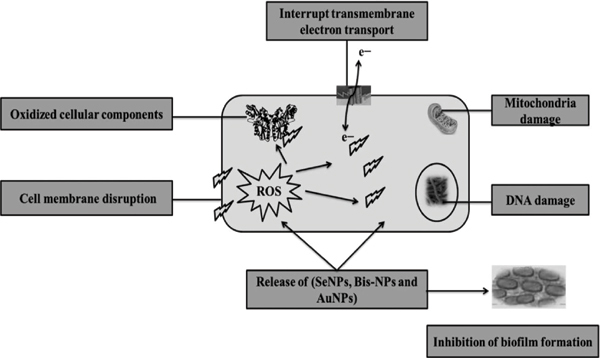 Objective: The mechanisms of bacterial resistance are described in this review and this is followed by an outline of the features and uses of metallic NPs as antibiotic agents to address bacteria that are antibiotic- sensitive and resistant. Additionally, a general impression of metallic NPs as antibiofilm bactericidal agents is presented. Conclusion: Biofilms and bacterial strains that are resistant to antibiotics present a grave public health challenge and this has enhanced the need to develop new bactericidal agents. Therefore, nanomaterials are considered as a potential platform for managing bacterial infections. Keywords: Biofilm, bismuth, gold, antimicrobial activity, nanoparticles, selenium. Keywords:Biofilm, bismuth, gold, antimicrobial activity, nanoparticles, selenium. Abstract:Background: Until recently, one of the main reasons for mortality has been infectious diseases, and bacteria that are drug-resistant have emerged as a result of the wide application, as well as the misuse of antibacterial medications. Having multidrug-resistance, bacteria present a great problem for the efficient management of bacterial infections and this challenge has resulted in the creation of other means of dealing with bacterial diseases. Of late, metallic nanoparticles (NPs), employed as antibacterial agents, have the potential for use against resistance to bacterial drugs.